Only SpecsPRO can tell you with no doubts which laptop is better Apple MacBook Pro with Retina Display or Apple MacBook Pro with Touch Bar. We have compared Apple MacBook Pro with Retina Display vs Apple MacBook Pro with Touch Bar configurations side by side: weight, display, processor, battery and all other specifications. 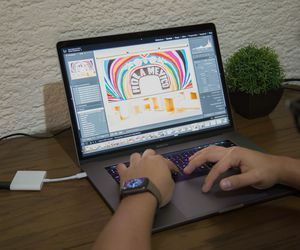 The Apple MacBook Pro with Touch Bar 15-inch, 2016 runs a more powerful processor than the Apple MacBook Pro with Retina Display 2013, 13-inch screen: Intel Core i7 (6th Gen) 2.6 GHz clock speed versus Intel Core i5 (4th Gen) 2.4 GHz clock speed. This is the most important difference between these laptops as powerful processor is the best buy for multitasking. The Apple MacBook Pro with Touch Bar 15-inch, 2016 uses a more number of memory 16 GB LPDDR3 SDRAM than 4 GB DDR3L SDRAM of the MacBook Pro with Retina Display 2013, 13-inch screen. This means that the Apple MacBook Pro with Touch Bar 15-inch, 2016 will easily run more number of design apps. The Apple MacBook Pro with Touch Bar 15-inch, 2016 is produced with a better WQXGA+ screen resolution which will allow the laptop owner to enjoy watching movies. The Apple MacBook Pro with Touch Bar 15-inch, 2016 is equipped with a 256 GB SSD, flash storage, flash storage, flash storage, flash storage, flash storage, flash storage, flash storage, flash storage, flash storage, flash storage, flash storage which is bigger than 128 GB SSD, flash storage, flash storage, flash storage, flash storage, flash storage, flash storage, flash storage, flash storage, flash storage, flash storage, flash storage of the MacBook Pro with Retina Display 2013, 13-inch screen. The Apple MacBook Pro with Touch Bar 15-inch, 2016 has a better battery life as it is equipped with 76 Wh battery which is 5 Wh bigger in comparison to the Apple MacBook Pro with Retina Display 2013, 13-inch screen cell. That's mean this model can be used longer without charging. The MacBook Pro with Retina Display 2013, 13-inch screen weighs 3.46 lbs which is 0.57 lbs lighter than the weight of the Apple MacBook Pro with Touch Bar 15-inch, 2016. The MacBook Pro with Touch Bar 15-inch, 2016 has 8 advantages and the MacBook Pro with Retina Display 2013, 13-inch screen only 1 so the MacBook Pro with Touch Bar 15-inch, 2016 will become the best choice. Get the lowest price on Amazon . Apple MacBook Pro with Retina Display and Apple MacBook Pro with Touch Bar comparison will help you to find out which laptop will become the best buy. The cheapest price for any of these notebooks you'll find in the list of offers from Amazon on the device pages. Besides Apple MacBook Pro with Touch Bar to Apple MacBook Pro with Retina Display compare specs of other laptops easily.